Quelques mots sur ce moteur atypique, qui s'apparente plus à un turboprpulseur caréné. Ce moteur est en cours de développement depuis un long moment. Самарский научно-технический комплекс — поистине уникальное предприятие, имеющее полный производственный цикл, от разработки и конструирования двигателя до его производства. Как шутят в СНТК, “дайте нам кусок руды — и мы сделаем вам готовый к взлету двигатель”. На счету предприятия много изделий, о которых можно безо всяких натяжек сказать: лучший в своем классе. Созданный в начале 1950-х годов турбовинтовой двигатель “НК-12” — признанный всеми шедевр конструкторской мысли. Он до сих пор поднимает в небо бомбардировщики “Ту-95” стратегической авиации России. Вообще следует отметить, что вся стратегическая авиация России — и “Ту-160”, и “Ту-22М” — летает на двигателях СНТК им. Н. Д. Кузнецова. В турбореактивных двигателях “НК-6” конструкторы КБ Н. Д. Кузнецова впервые в мире применили лопатки турбин из монокристаллического сплава титана с никелем, рением и рутением. Они поднимали в небо самолеты “Ил-62” и “Ту-154”. 40 процентов пассажирских перевозок СССР обеспечивалось двигателями КБ Н. Д. Кузнецова. Модификация двигателя “НК-6” — двигатель “НК-86”, снабженный звукопоглощающими панелями, по шумовым параметрам до сих пор удовлетворяет самым строгим требованиям ИКАО. Последний двигатель СНТК, выполненный “в железе”, — “НК-93”. Хотя разработка “НК-93” началась еще 15 лет назад, его экономические характеристики по сей день лучшие в мире. Удельный расход топлива — 0,49, в то время как у всех остальных — не менее 0,58—0,56. Другими словами, “НК-93” на 20 процентов экономичнее самого экономичного зарубежного аналога. “НК-93” предполагается использовать в самолетах “Ту-330” и новых модификациях “Ил-96”. Обидно и нелепо другое — разработка “НК-93” была завершена еще пять лет назад, и по плану серийное производство его на Казанском заводе должно было начаться в 2004 году, но из-за отсутствия необходимых средств до сих пор не проведена даже его сертификация. Poussée affichée 18 T pour le moment. A noter que Kuznetsov dispose d'une très large part du marché des turbines à gaz industrielles en russie... de quoi avoir des rentrées régulières. Cet engin, nécessite une airframe à ' ailes hautes'..
Ceci dit, les Sovieto-Russes ont une grande expérience dans ce domaine..
Voici une photo de l'engin en essais sous l'aile d'un Il-76. Son diamètre serait de 2,90 m (pour le fan, je n'ai pas trouvé tout compris) et sa longueur de 6 m.
A comparer avec, par exemple le PW2000 de la même gamme de poussée. Il fait de 2 m de diamètre et de 3,6 m de long. C'est environ 50 % en plus pour le NK93 dans les deux dimensions. A vérifier, mais le D-30, son voisin sur la photo, doit faire environ 1 m de diamètre. Two test flights of Russia's NK-93 ducted fan prototype engine have been completed on board an [url=http://www.flightglobal.com/landingpage/ilyushin il-76.html]Ilyushin Il-76[/url] flying test bed, and the engine could be ready for first deliveries in 2009. L'article date de fin 2007. Le NK93 était toujours présenté sous forme de maquette au MAK2009, cf photo introductive ! Il devrait être livré à partir de cette fin d'année.. mais pas de cellule pouvant le supporter ? At the time of the 1980s competition, Dvigateli NK (then known as Samara) chose a more innovative approach to engine development with its NK-93 shrouded propfan. The objective at the beginning of the project was to develop a 175kN (39,6001b) high-bypass engine for subsonic transport aircraft with high fuel efficiency of 0.49 kg/kgf/h in cruise conditions. The development of the NK-93 began in 1987, with testing starting in 1989. The fan engine now under development in ojmara is a 17:l-bypass geared powerplant which features two synchronised counter-rotating integrally shrouded propfans. 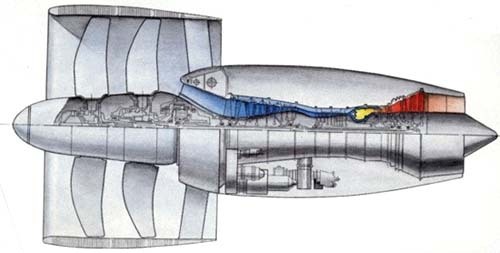 About 87% of the thrust comes from the propfans, while the gas generator produces the rest. Seven complete test engines have been assembled since 1989. The NK-93's forward propfan rotates clockwise, while the aft propfan rotates counterclockwise. Each is driven by a separate shaft from the powerplant's 22,350kW (30,000hp) planetary gearbox, which has seven satellites. There have been problems in developing a gearboxof this size with adequate bearing durability, oil distribution and gear-teeth strength. These problems are claimed to have been solved. The planetary gearbox is being designed for a service life of 20,000h, and time between overhauls should be about 7,500h. By the end of 1994, Samara had accumulated 2,800 test hours, including the tests of the NK-110, the gas-generator prototype, and l,700h of testing on the NK-93 and its components. The required take-off thrust of 176kN has been achieved with specific fuel consumption of 0.234kg/kgf/h. Turbine-inlet temperatures of 1,700°C have been achieved, along with a mass airflow of 976kg/s, a gas generator pressure ratio of 25:1, a maximum thrust of 200kN, reverse thrust of 37kN and shaft rotation speeds of 1,580RPM; 11.270RPM and 15.480RPM for each of the shafts respectively. Turayevo, to obtain speed-altitude characteristics. 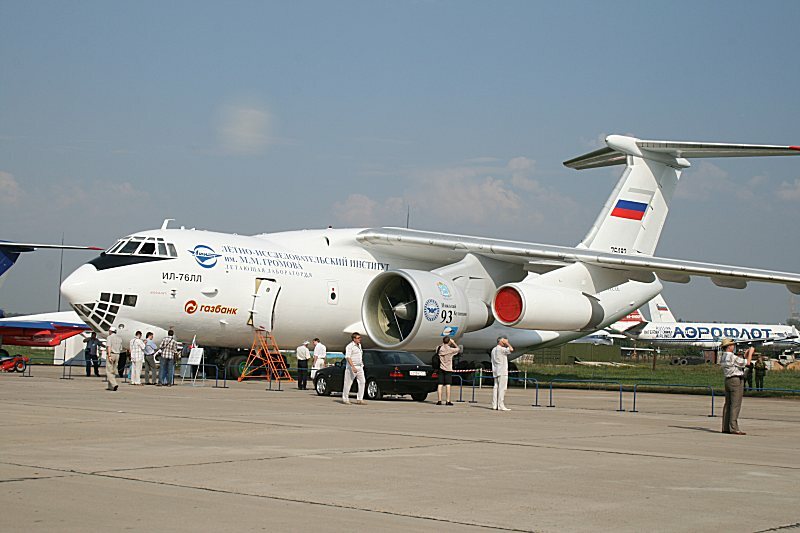 After that, the engine may be installed on an Ilyushin 11-76 testbed. taking the engine to its production phase, despite finance being provided at a fraction of what is really needed. Gros diamètre n'est ce pas ? Où l'on apprend le poids de la bête : 7.5 t sous l'aile (nacelle + pylone ?) pour 18t de poussée et son architecture interne. C'était en 2007 un 3 arbres réducté hydride entre un 3 arbres turbofan classique et un 3 arbres turbopropulseur (PW150, TP400...). Diamètre: 3 m ce qui correspond au T900 je crois qui pousse presque le double. The Gromov LII Flight Research Institute (Zhukovsky) has launched flight tests of the advanced 18,000 kgf NK-93 turbopropfan engine featuring the unique shrouded propfan design (in fact, it is a super-high-bypass- ratio turbofan with the reduction gear-driven fan). The engine has been under development since 1990 by the Kuznetsov Scientific and Technical Complex in Samara for use on future derivatives of the Ilyushin Il-96 and Tupolev Tu-204 (Tu-214) airliners and Tu-330 (Tu-204-330) freighter. The NK-93 was conceived to differ from production turbofans of the same thrust class in the cruising- mode fuel consumption reduced by 10–20%. The calculations suggest that it could equal 0.49 kg/kgf/hr (compare that with the 0.595 kg/kgf/hr of the production PS-90A with the 16,000 kg in the same mode or with 0.546 kg/kgf/hr of the more powerful D-18T with its 23,400 kgf). The NK-93 has stemmed from the NK-92 super-high-bypass-ratio turbofan programme pursued by Kuznetsov to power the future Ilyushin Il-106 heavylifter with a carrying capacity of 80 t. However, the Il-106 programme stalled at the preliminary design stage in the early 1990s, with the NK-92 grinding to a halt as a result as well. However, a number of its design solutions were used in developing the ‘civilian’ NK-93. The latter was derived from the engine core of the NK-110 pusher-type propfan engine prototype that had been rig-tested since 1989. 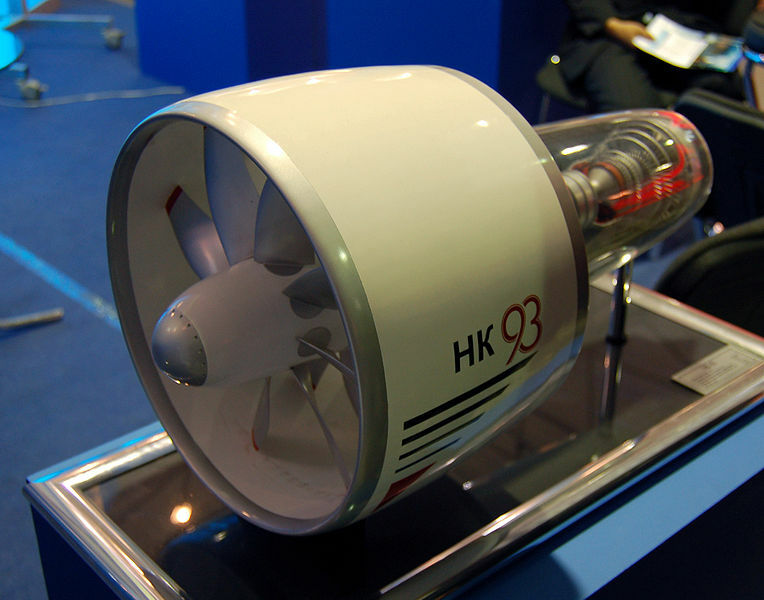 The NK-93 comprises the 2,900 mm diameter SV-92 double-row propfan with rotating blades in the annular channel (contrarotating eight-blade first and 10-blade second rows); seven-stage axial low-pressure compressor; eight-stage high-pressure compressor; annular combustor; single-stage high- and low-pressure turbines, three-stage propfan turbine and non-variable jet nozzle. The engine has the electronic control system backed up by the hydraulic-mechanic redundancy. To date, Kuznetsov has made as many as 11 full-scale NK-93 engines, most of which have passed the full cycle of rig tests. The NK-93’s flight tests on Gromov LII’s Il-76-based flying testbed were to begin several years ago, but the lack of funding has delayed the tests until late last year. A NK-93 prototype (No 10) was prepared for test flights. It had been brought to Gromov LII as far back as 2005 and displayed at the MAKS 2005 air show. Engine No 9 was prepared as the backup. For the trials, Gromov LII provided the Il-76LL (c/n 3908, registration No 76492). The aircraft used to fly test mission in support of the PS-90A now powering the Il-96, Tu-204 and Tu-214. Its adaptation to the NK-93 began last year and was completed in December. The NK-93 first flew on its left inboard station on 29 December 2006. The NK-93 was not supposed to start during its first flight, autorotating instead. The next test flight took place on 3 May 2007 with the engine running. about 3 m – twice as large as the production D-30KP powering the Il-76, 1.5 times larger than the PS-90A’s diameter and 25% larger than the diameter of the most powerful engine in Russia and Ukraine, the D-18T, whose thrust is 30% higher, by the way. to enable the engine to rival other designs in the class. Ensuring an acceptable service life of its powerful reduction gearbox driving its huge propfan is a problem too.